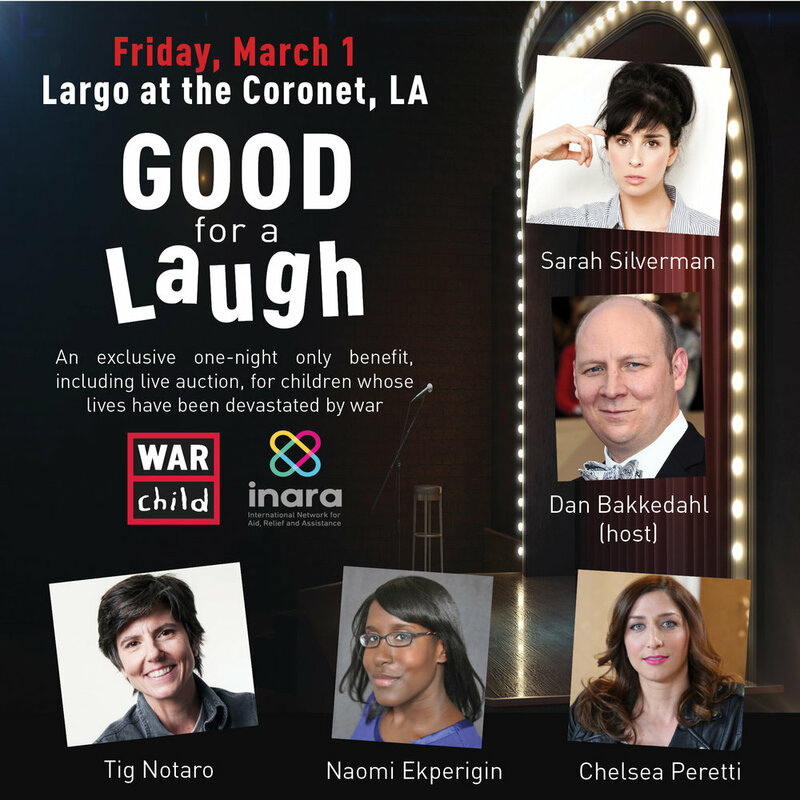 Comedian and Hollywood Star Sarah Silverman along with an all-star group of hilarious friends today (February 14, 2019) announce they are teaming up for Good for a Laugh, a comedy fundraiser to help support two organizations helping children whose lives have been devastated by war: War Child USA and INARA. “I know I speak for all us knuckleheads when I say we are so grateful to get to be a part of this. If we can lure you in with a show and get you to learn about War Child and INARA on the way, everybody wins. These are massively needed programs led by wildly compassionate, effective experts in their fields,” said Silverman. This event has been made possible thanks to the support of event co-chairs, actors and humanitarians Amanda Seyfried and Thomas Sadoski. Good for a Laugh’s Host Committee – featuring actors, producers and broadcast journalists among others – also includes: Patrick J Adams & Troian Bellisario; Beth Behrs & Michael Gladis; Betsy Brandt; Angelique Cabral; Elan Gale & Molly Quinn; Erica Gray; Colin & Samantha Hanks; Mary Kitchen; Keltie Knight; Chantal Kreviazuk; Cara Santa Maria; Natalie Morales; Olivia Munn; Christina Ochoa; Alison Pill & Joshua Leonard; and Sarah Rafferty. Good for a Laugh will benefit two organizations supporting children whose lives have been devastated by war. The first, War Child USA, protects children from the brutal impact of war by getting them back in school, lifting their families out of poverty and ensuring their rights are respected. The second organization, INARA, provides life-altering medical treatment for war-wounded refugee children from Syria to help them build happier and healthier futures. The event is sponsored by CNN, CBS and Lyft. Hitch a ride to the show with Lyft and use the event code Goodforalaugh to receive a special discounted fare. Those interested in event sponsorship, please contact: barbara@warchildusa.org.